From Oklahoma’s News9: Gun Rights Advocate Talks About New Book In OKC. Emily is senior opinion editor at the Washington Times and was a guest at this years Second Amendment Foundation (SAF) Gun Rights Policy Conference (GRPC). 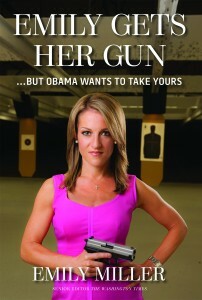 Below she talks about the subject of her new book: Emily Gets Her Gun…But Obama Wants to Take Yours (Amazon). Dehumanization of the enemy may be the original-sin of propaganda.